From the title of the book I expected it to be about birds so I was amazed to open the front end papers and find pictures of dozens of nests including those of hornets, orangutan, African gray tree frog, and platypus. True, there are a lot of birds too but the inclusion of these unexpected nests was a delight. 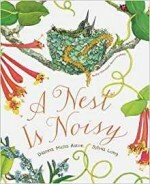 Written for children ages five to eight, A Nest is Noisy by Dianna Hutts Aston introduces readers to many different facts about a variety of nests. Nest can be noisy is just one of their interesting characteristics. They can also be spiky, papery, hot, hidden, neighborly, muddy, adopted, or quiet. Readers learn many things about nests such as those of the bee hummingbird are wrapped in spider silk, the dusky scrub fowl’s nest can be thirty six feet in diameter, and that the gender of an alligator is determined by the incubation temperature in the nest. Watercolor illustrations of the nests are detailed and labeled and provide visual reinforcement to the text as well as add color and interest. A better book on nests is difficult to imagine! To buy A Nest is Noisy from Amazon.com Click Here.